This cabinet was made from the reclaimed packaging materials that the table saw and 3 other woodworking machines were shipped in. 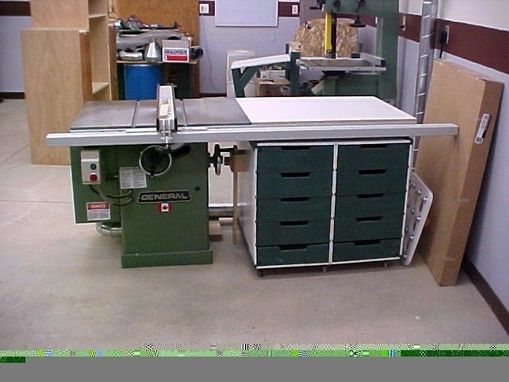 The cabinet is on heavy-duty casters and can be pulled out to clean behind, or to access the angle-tilting wheel for the table saw. Each drawer holds various woodworking parts or tools, and the drawers are accessible from both front and back of the cabinet. In lieu of handles or drawer pulls, finger/hand cut-outs were cut into the top of each drawer for ease of use. Also, there is an adjustable roller that can be used on the outfeed side of the table saw for support of cutting long boards.